There were days when only radio officers operated radio equipments. Deck officers had nothing to do with the radio equipments. With GMDSS equipments all deck officers are radio officers now. With this new responsibility, came new challenges. Deck officers have since tried their best to fill the gap of radio officer and they have done pretty good. But there are always few things we never find in book. We call these things “practical experiences”. Many of these were lost with the radio officers but not all. 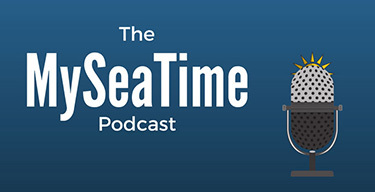 Deck officers now need to know everything about how to make best use of GMDSS equipment. But GMDSS equipments are of no use, if these wont work when required. There are many functional requirements of GMDSS equipments. We can only be sure if these will perform or not by testing these at regular interval. Each GMDSS equipment has a testing interval and procedure to test. Familiarity with the GMDSS equipments is also essential to avoid PSC detentions. 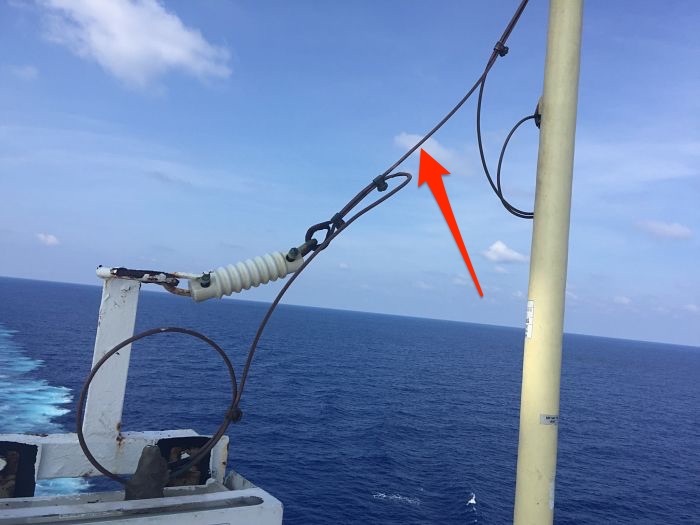 In this post I try to solve this problem with testing of MF/HF equipment and what to do if test fails. 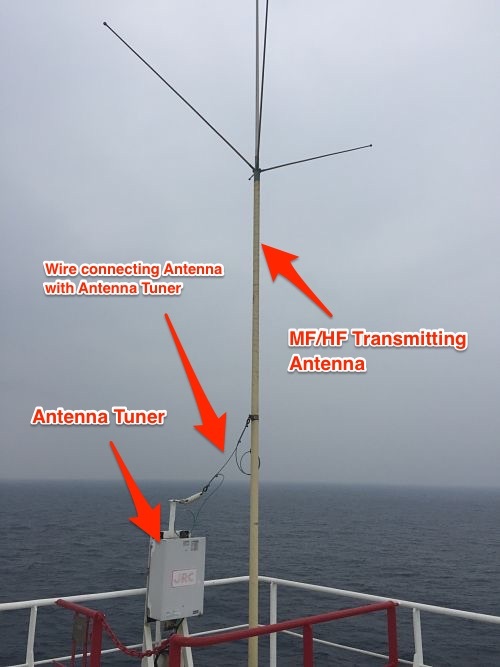 MF/HF equipment is for sending distress alerts over long range. We need to test MF/HF equipement to be sure of its functionality. Lets see what all test we need to do on MF/HF equipment. I will show this on JRC equipment MCU-331F. If you have worked on this system, it has a remote mode and local mode. The options to select the tests can be accessed from both modes. Besides some makers may have few other daily tests specific to the equipment. Lets see how each of these daily tests are done. What does a successful loop test signify ? If the modem loop test is OK, it means that on receiving a message on MF/HF, it would definitely be processed by the equipment. In other words, it means that received message will not be lost in the loop of the equipment. 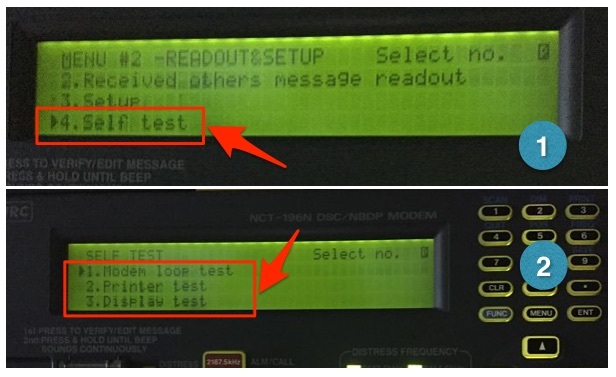 In the modem loop test, the equipment send and receives a message internally. If all the loops of the equipment are OK, the message will be transmitted and received without any trouble. Go to Menu#2 -> READOUT & SET UP -> press 4 -> press ENT. This displays the “SELF TEST” screen. Select the “Modem Loop test” and press ENT. Menu#2 is accessed by pressing “Menu” twice. Go to FUNC -> Test -> Modem Loop test and press enter on keyboard. If the test is successful, OTHERS LED will light up and buzzer will sound. Press STOP to stop the buzzer. 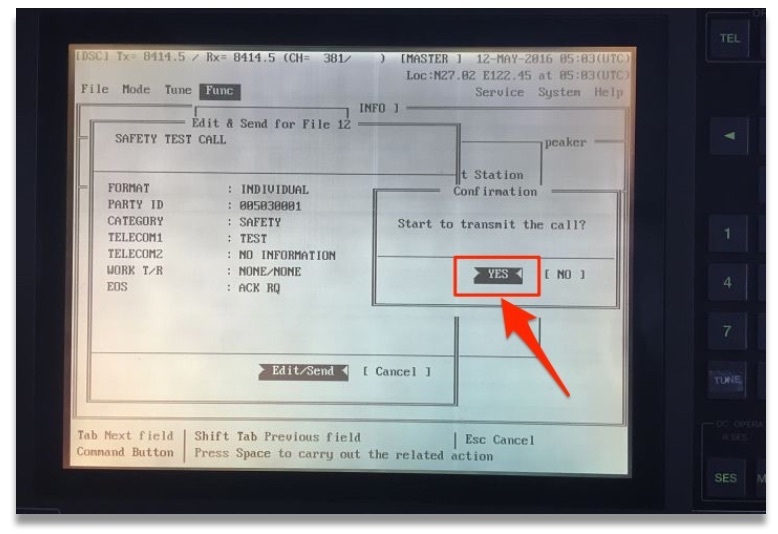 We can then file the print out of the Modem loop test either in separate file or in GMDSS log book. 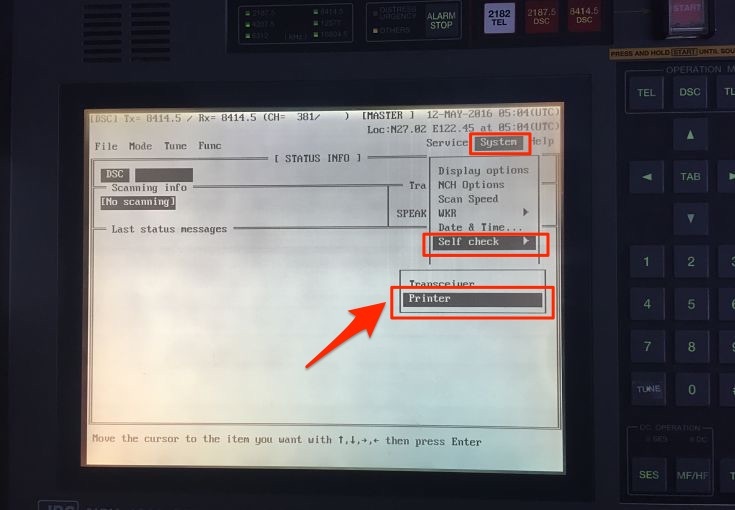 On receiving a MF/HF message, We tend to look at the print outs than in the screen of the MF/HF equipment. It is convinient to look at the print outs and there is no doubt about that. This makes the printer an important part of the MF/HF equipment. Print outs are also important for record keeping of distress communication. Testing of printer thus is important. Printer test checks the connection between MF/HF equipment and printer. Go to Menu#2 -> READOUT & SET UP -> press 4 -> press ENT. This displays the “SELF TEST” screen. Select the “printer test” and press ENT. If the printer prints all the characters, printer test is pass. As I said earlier, there can be other equipment specific daily tests and vessel should do these test as per Maker’s manual. Most of us think that weekly test is only DSC test with shore station. We must understand that DSC is only one mode of distress communication. We also need to test our R/T and NBDP every week. Lets see how we should do these weekly tests. Every week, we need to test the DSC operation with the coast station. Go to FUNC -> Edit/Send -> Safety test Call and then edit the message if required. On prompt to “transmit the call”, Choose option “yes”. This will send the DSC test call to shore station. 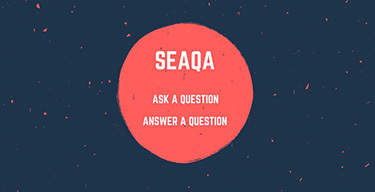 Test will pass if you receive the response back with “EOS” as “ACK BQ”. It is important that these test calls are not made on 2 MHz frequency and are not made as an “all station” call. What to do if you do not receive the acknowledgment from shore station ? Well most of us would agree that this is common situation. And many of us leave it thinking that shore station is not answering. We fail to acknowledge that the problem could be with our equipment. Some of us believe that filing the test with remarks “No response from shore station” is OK but it is not OK.
Another few has a file with “Typed message” similar to the test with shore response. They just take printout of this message to forge the record to show that the test was done. Whereas actually either it was not done or was done with no response from the shore. It is very easy to catch if the record was forged or the test was actually done. So here is how we should proceed in case we do not receive acknowledgment from shore station. First try again with other stations and on other frequencies. If you are trying to send a DSC call to a nearby station on higher frequency, chance are that they will miss it. This is because, all frequencies has a blind spot near to the transmitter. Higher the frequency, larger is the blind spot distance. Lets assume that with all your efforts, you still could not get the shore acknowledgment. Next you should try to test the DSC call with a ship station. Testing with ship station is similar to testing with coast station. We just need to change the ID to the ship’s MMSI number of the ship you are testing the DSC with. If possible we should do this ship to ship test on non-distress frequency. If we still did not get the acknowledgment from the ship, ask the other ship if they received your test call. If they did receive, your transmitter if OK. If they did not receive your test call, expect problem with your transmitter. Now ask the other ship to send you the test call. See if you can receive her test call. Try it on lower frequencies like 4 MHz. 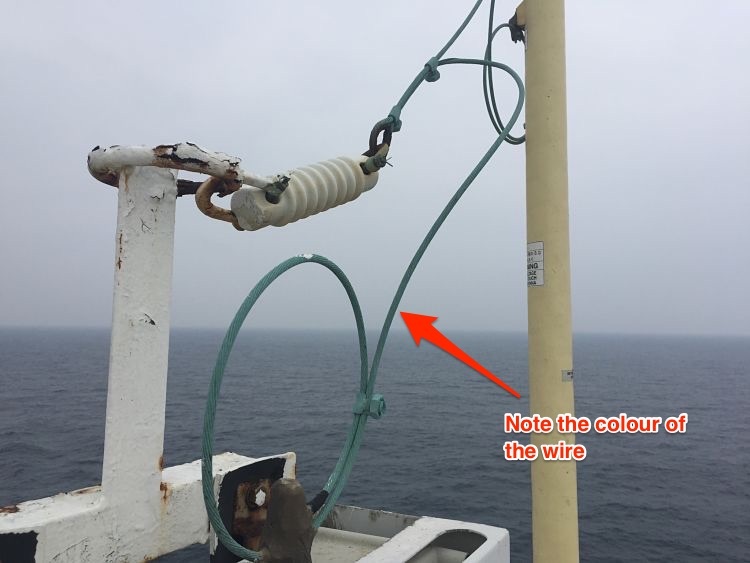 If you do not receive the other ship’s test call, your receiver is not OK.
Now that you know if the problem is with your receiver, transmitter or both, lets troubleshoot it further. If MF/HF is not transmitting, the JRC manual just ask to call for the service engineer. But there are few other things we can do to avoid this. 1) if you were able to test the DSC with ship but could not test with shore station. Though this is acceptable sometimes but if your all the last few tests are with ship, it is not acceptable as this can be interpreted as a defect. In this case transmission of MF/HF is OK, but the transmission power is greatly reduced. This is how you can proceed to solve this problem. Press Menu on the MF/HF controller -> scroll the dial to go to “Power” option -> set the power to High -> press Enter. Even after setting the power to High, still you may not get acknowledgment from shore station. In this case first switch off the MF/HF equipment and clean the transmitting antenna. This Antenna is located on the Monkey island. The transmitting antenna is connected with the antenna tuner. The connection between antenna and antenna tuner is with a copper wire. In most of the cases you will find this wire to be of green color which is not its original color. Remove this wire from all the connections and clean with emery paper to remove the green deposits. Do not put anything (grease, Varnish etc) on the wire after cleaning it. Connect the wire again and test the DSC with shore station. Most cases, you will be able to test with shore station. If you were not able to get the acknowledgment from ship as well as shore station, check if the antenna is tuning. Different equipment has different ways to show if the antenna is tuned or not. Some equipments shows message “Tune Not OK” on the screen. Others like JRC, will have the “TUNE” blinking on the screen. If you see any of these, tune the antenna, by pressing “ANT TUNE” button. If this does not tune your antenna, suspect problem with Antenna tuner. Antenna tuner is either located in the wheel house or on the monkey island. If the tuner is on money island, and if the sealing of cover is not appropriate, there are chances of burnt PCB. Switch off & isolate the GMDSS station and open the cover of Antenna tuner. Check for any obvious burnt PCB signs. If there are no visible signs, you need to communicate with maker highlighting the problem of antenna not tuning. The first sign for a poor receiver is no sound on the MF/HF equipment. Tune into any R/T frequency and increase the volume. Do you hear any sounds ? If you do not hear any sound, try adjusting RF gain. If you still do not hear anything, MF/HF is not receiving anything. Another way to know if your receiver is OK is to check the time signal. If you do not receive time signal from any stations, you can assume problem with your MF/HF receiver. In case of poor receiver, you can check and clean the connection of the reception antenna. The MF/HF reception antenna is usually placed on the forward mast. If you still do not get anything, most likely the problem lies in one of the PCB of the MF/HF receiver. You should communicate with the maker and if required request for their attendance. Apart from DSC test, we also need to test if our R/T and NBDP are working as these also form part of the MF/HF equipment. You can test the R/T with a ship station. To test R/T, Switch to a non-Distress R/T frequency and talk to a passing ship. Follow same with the testing of NBDP. Switch to a non-distress NDBP frequency and communicate with a ship on NBDP. Any broken aerial or insulator. If any insulator or aerial is broken, order it and replace it. Any salt deposits on the aerial. It is a good practice to clean the aerials with fresh water every month. Connections on the aerial are intact and clean. It is important that all the connection are clean, free of rust and other deposits. If these are not clean, it can reduce the transmission/receiving power of MF/HF drastically. We already discussed one example of this with the wire connecting aerial with the tuner. MF/HF equipment is a very important part of GMDSS and bridge equipments. If a similar equipment was on board Titanic, it is possible that not a single person would have died. Keeping this in a perfect shape is the responsibility of ship staff. Testing MF/HF regularly and religiously helps us achieve that. In case of unsuccessful test, we should find the reason for that and correct it. 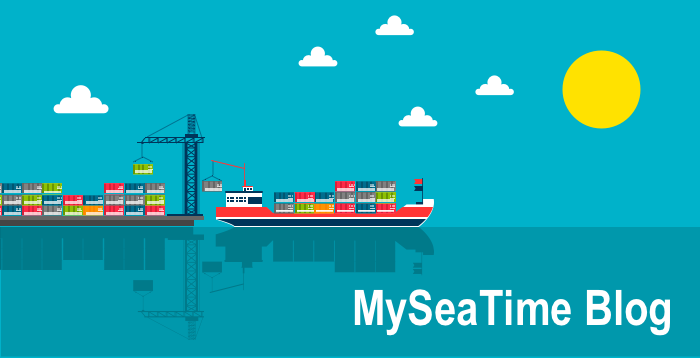 It's really excellent to guide mariner via blog spot., a great initiative. Want to appreciate all of them who made tis effort. A big salute. Thanks for your kind words. We are on a mission to share everything we learnt from our journey of Cadet to Master and Trainee to Chief engineer & beyond. And We are still learning...and so will the seafarers on this journey.. Thanks for being a reader..
Good Morning sir, I am a fresher cadet and i am trying to make a test call to a Coast Station, but i am not getting acknowlegement. is it ok if i am using 2187.5 khz frequency for making a test call? No it is not OK Imran. By doing so you may be blocking an actual distress call of a nearby ship. This frequency is used for transmitting distress call to nearby coast station as well as ships and should never be used for testing. If you are not getting acknowledgment from shore station, follow what I posted in this blog. Let me know if you have any other question now or anytime in your career. Hi sir Rajeev. 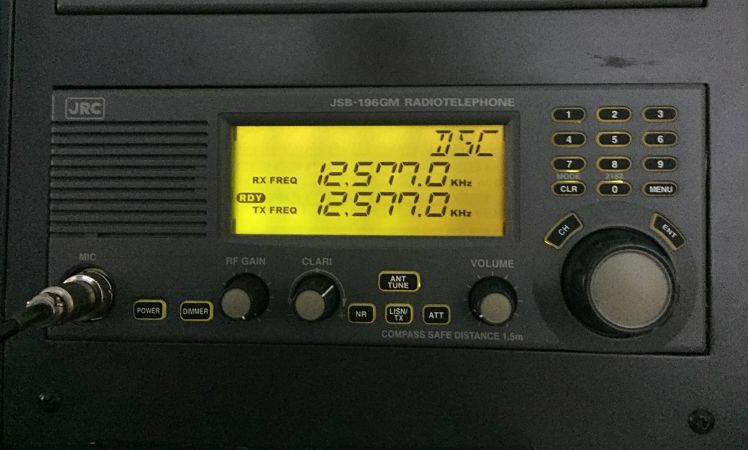 So what is the recommended frequencies to be use for sending dsc testcall on shore stations? Thankyou and more power to you..
Bt why you mentioned only 2 Mhz to not to use for weekly testing? Before testing it is required to check the details of the coast stations in ALRS ar ADRS whether they have MF/HF DSC facilities or not. Many stations are equipped with only MF DSC Frequency, for sure we will not receive anything if we try it on some other HF frequency and another important thing is check the rough distance between ship's position and the coast station and choose the frequency accordingly. If we are in distress we would not prefer to send the distress call on 16 MHz to an Australian station when we are in Arabian Sea. Our first preference will be a coast station & ship station nearby. So 2MHz is the preferred frequency for distress communication. This is the frequency where if we use for testing or routine communication, we are most likely to hamper an actual distress situation. 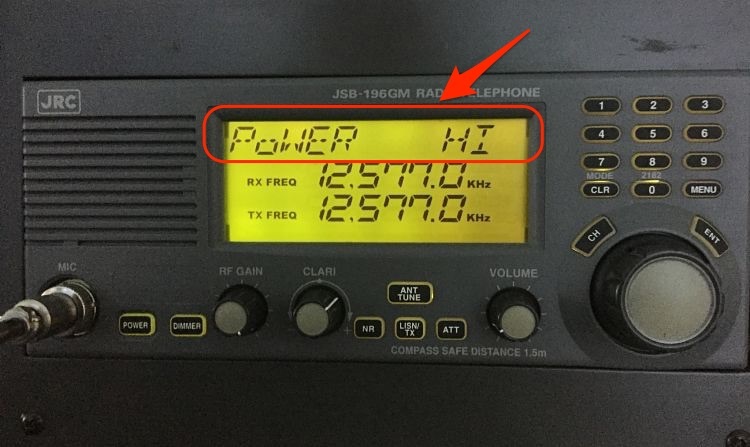 HF frequency has range upto more than 3000NM so there is no need to use MF frequency when we can easily get a HF station in range. Off course we need to see which HF station is available in range but we need to remove the MF frequency from our list of testing. Hope that clarifies. Let me know if you have any other question Amit. But what i have been taught is that range depends on the frequency we choose. 4 Mhz covers approx about 400 NM ,8MHz covers approx about 800 NM and so on. And i have observed it too. Not all HF frequency will give 3000 NM range. In west africa I always use capetown for testing and its a HF station . Recently a vetting inspector pointed me out why no acknowledgement ar testing on 2Mhz ...ofcrse i had few with ship stations, so he was ok. But i have seen inspectors asking about 2 Mhz. Regarding hampering the real distress alert , anyway it will keep on repeating every 3 mins until its acknowledged by any station. As frequency increases the range decreases. Thank u very much for the clarification. Happy that it could clear few of your doubts Maksood. Let me know if you have any question. Hope to see you read future posts too..
As I was going through this blog again....a couple of questions rose out again : 1) What if I select ''Individual Call'' instead of ''Test Call'' (There's no Test telecommand in Individual Call) ? 2) When I do the DSC test with a ship station, it will not be possible to do it on a non-distress frequency as all MF/HF equipments are designed to keep watch only on Distress frequencies. 3) When I do DSC test with a vessel , ofcrse the vessel will be a nearer one, within 12 NM circle ar little more....There are high & likely chances that the vessel will miss out the DSC call if I do it on a HF Frequency even 4MHz....so again I have to go back to 2Mhz for testing. Please correct me where ever I am wrong. 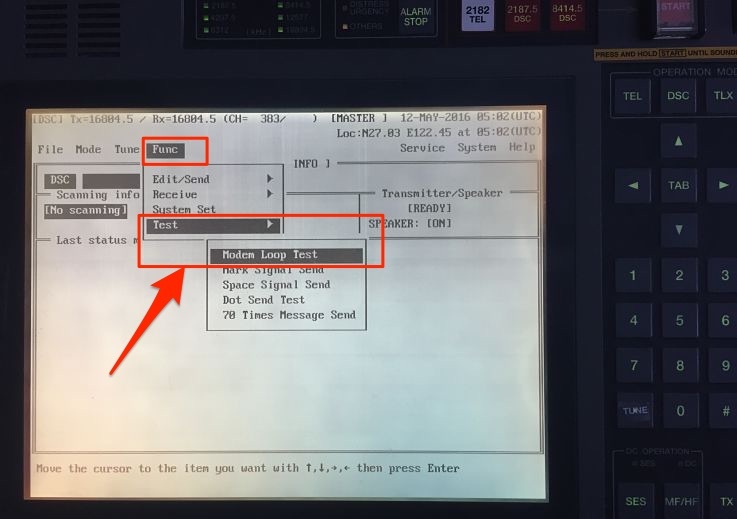 1) Individual call is OK, infact some equipments have test option under individual call. 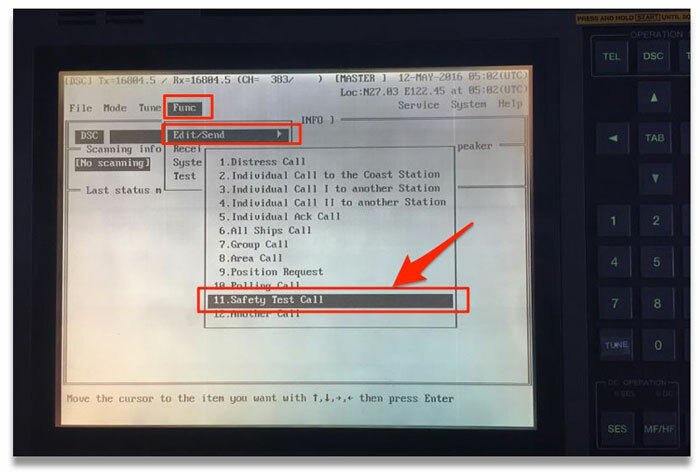 As long as you could test the equipment with Individual call, it should be OK. 2) When doing test call with a ship, we usually get in touch with that ship on VHF. And then test the equipment and ask that vessel to acknowledge it.So we should test it on non-distress frequency. 3) You may or may not get the near ship on 4Mhz as the blind spot can depend upon many factors. During distress situations we cannot take any chance so we have to transmit on appropriate frequency but for testing we can try on different frequencies. Like with the ship we can try on 4Mhz to see if they get it otherwise we can try on 2MHz non-distress frequency. In Open sea, with no coast station in range of 2 Mhz, we may test on 2187. Idea is to try not to interfere with any possible distress communication. You need to check the time at which a particular station transmits time signal from ALRS and then login on that frequency and wait for the signal to sound. We can then compare chronometer time and the time this signal was supposed to be heard. Im wondering what do PSC inspectors in china are refering when the say "No evidence of NDBP test". Can u please show me how to do the test? like u did on top.. thnx a lot.. Many seafarers gets confused with NBDP. Surely a topic to write about. I will write on that soon.. I will write on that shortly Radoslaw.. Thanks a lot, I cannot wait, I suppose as the others. I really enjoy reading your blog capt. Rajeev :) . I can't wait for NBDP issues clarification! Glad you liked it Noman..
Apart from Daily tests on Sat-C, we need to do weekly performance test and Distress button test..
Sir , if possible kindly explain how to do the draft survey in bulk carrier ? . I will right on draft survey shortly..
During loading & discharging , how to solve the stress problem in bulk carrier ? I am not an expert of bulk carrier operation but I can write on dealing with stress issues on ships..
Gd sir! I need assist from you.MF/HF SRG-1150DN System self test report "received:error,Wach-R:good,Exciter:error,Tuner:good" .so i can not get DSC acknowledgment from ship or shore station.Ask other ship,they received my test call and replied.Please tell me problem detail with it.Thanks you so much. sir i have been trying out my RT call with other vessel and after pressing the TX button and PTT on the handset....my voice is going through but i am receiving an error: "PA error (32) Module A" & "PA error (33) Module B" & "PA error (31) Detune". kndly help as i am not able to find any info as to what should be the corrective action. Also what frequencies are advised to use for RT call testing.? Good day sir, I would like to know how to test two tone alarm of MF/HF Radio for JRC Model JSS-296/596/896 or JSB-196GM R/T ? Thanks. Why hf frquencies disabled? It is also mentioned in srt cert .. Kindly advive. DSC console modem. 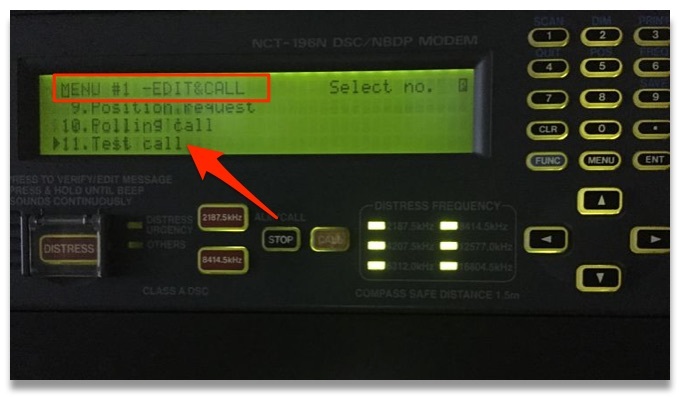 Product name is " JRC NCT-196N DSC/NBDP Modem" When I try the call button is unresponsive only showing transmissible on the test call menu. I've already cleaned the aerials , checked the connection and also set the transmission power to HI still same results. Kindly Assist. How do I get the transmissible to go away from the test call call menu and for the Call button to work..? Also When I perform modern loop test on the same equipment, own address is "000000000" on the print out. How do I change it on the local mode to ships MMSI address. Plus only 2187.5 and 8414.5 LEDs are highlight on the DSC console.LEDs for the following distress frequencies are off. 4207.5 12577.0 and 6312.0 and 16804.5 My vessel had 2 inm-c terminals thus we don't have the Remote mfhf/nbdp terminal. So everything has to be done locally on the JRC NCT-196N DSC model. How do I go about rectifying all these. Please note I received a successful BQ ACK from weekly test call just 2 days ago. The it got colder outside temp now 15 degree. I don't know if that's also a factor. But I've cleaned the aerial/antenna checked the connection and all no loose connection or breaks. Kindly assist because PSC inspection is due... Do send an email to glaciouschronicles@yahoo.com. ASAP. Thanks. Why we should not made test call on 2 MHz channel sir, thanks. Sir could you advise about the weekly vhf test call? Usually i just made a call to my own second station and vice-versa. But during the last internal audit i was asked why i had not performed vhf dsc call with coast station while in range. I tried to find any information about this in GMDSS manual, STCW and some others sources but no success. Also i have never seen that anybody doing this. To my mind it's not good idea to use 70 vhf channel for routine testing with coast station as well as 2187.5 for MF. So only way is to call to your own station. Please clarify on this matter. JRC NCH-1962 controller. What to do if in func menu only Edit/send and Receive. But test and setup system is not available? I can’t fulfill modem loop test. Which HF stations reply to DSC test calls? Most of them don't do it anymore therefore testing is difficult. 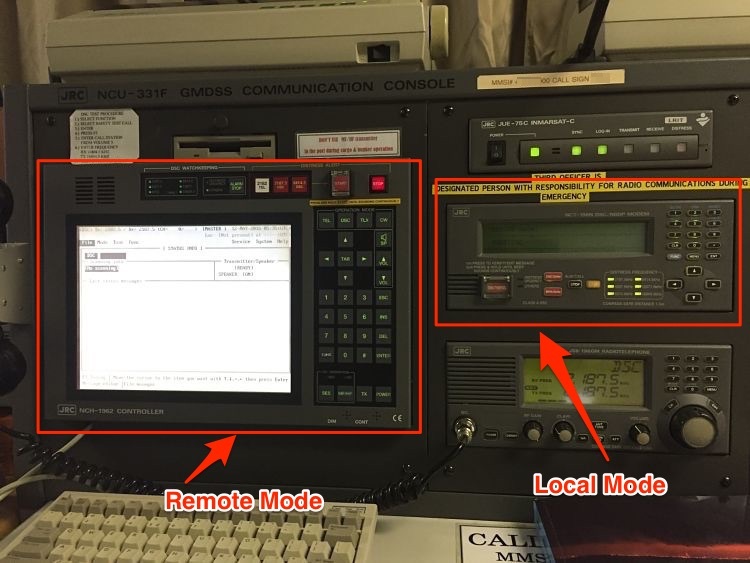 You just don't know if your GMDSS is broken or it's just not that station. Good day. We are in port STS,no cargo operation. Its allow to perform weekly/monthly GMDSS test? Helpful essay i like it so much, but FYI "EQUIPMENT" word always written without "S"
How to deal with my jrc jsb196gm radio. It's shows on lcd " PLL UNLOCK". Can't hear speaker. Can MF DSC self test be affected by weather? Sky has been overcast these past days in our area and there are instances that the self test fail show. Is weather a factor too?